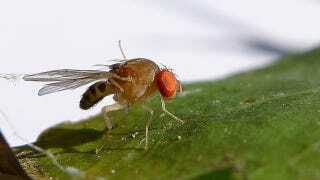 Reaffirming that age-old maxim that alcohol is the cause of and solution to all of life's problems, fruit flies have devised an ingenious strategy to protect their unborn young from parasites. They simply lay their eggs in alcohol, and somehow that solves everything. The researcher who decided to expand that "somehow" into, you know, an actual scientific explanation is Emory evolutionary geneticist Todd Schlenke. He and his team observed that fruit flies are to recognize the presence of tiny parasitic wasps that, if left unchecked, would inject their own eggs inside the fruit flies' larvae and potentially devour the tiny fruit flies from the inside. "The adult flies actually anticipate an infection risk to their children, and then they medicate them by depositing them in alcohol. We found that this medicating behavior was shared by diverse fly species, adding to the evidence that using toxins in the environment to medicate offspring may be common across the animal kingdom. Our data indicate that the flies can visually distinguish the relatively small morphological differences between male and female wasps, and between different species of wasps. The fruit fly larvae raise their blood alcohol levels, so that the wasps living in their blood will suffer. When you think of an immune system, you usually think of blood cells and immune proteins, but behavior can also be a big part of an organism's immune defense." "The fruit flies clearly change their reproductive behavior when the wasps are present. The alcohol is slightly toxic to the fruit flies as well, but the wasps are a bigger danger than the alcohol. The flies that we work with have not seen wasps in their lives before, and neither have their ancestors going back hundreds of generations. And yet, the flies still recognize these wasps as a danger when they are put in a cage with them. This result was a surprise to me. I thought the flies were probably using olfaction to sense the female wasps. The small, compound eyes of flies are believed to be more geared to detecting motion than high-resolution images. We tested a number of fly species and found that each fly species that uses rotting fruit for food mounts this immune behavior against parasitic wasps. Medication may be far more common in nature than we previously thought." Original paper at Science. Image by Johnn Tann on Flickr.